GiGi Erneta in Happy Death Day 2U! Finally the epic event the Dallas-Fort Worth metropolitan area has been waiting for. On Saturday October 17, 2015 at Central Park in Grand Prairie, Texas, city officials and land developers were more than ecstatic to go into details about the new $75 million water park and event center that they will be bringing to the city. The attraction will be called “The Epic”, a name very appropriate for the large-scale water park. The Epic water park is expected to consist of a 60,000 square foot indoor and outdoor water park, a 120,000 square foot fitness center, and a special playground. Due to the indoor and outdoor water park it will allow for guest to swim year round, despite weather conditions. There is also talk of The Epic including trails, a library, and an amphitheater. In order to fund The Epic, voters of Grand Prairie agreed to a 1/4 increase in sales tax. At the groundbreaking event on October 17th families and residents of Grand Prairie and all surrounding DFW cities were invited to come out and celebrate. From fun activities such as rock climbing, to live music, to booths that were set up vending food, games, and informational pamphlets about the future land development, the ground breaking ceremony was more of a local carnival. Kicking off at 7:00 p.m. that evening the Mayor of Grand Prairie, Ron Jensen, introduced the city council and the designers of The Epic water park. Following the introduction of the people who made The Epic possible, Jensen welcomed to the stage the live entertainment, Grammy Award winning artist Max Baca and Los TexManiacs. Proceeding the two hour free concert and continuation of the games and vending of food there was a grand finale. The climax of the night included the groundbreaking of The Epic followed by an immense fireworks shows. 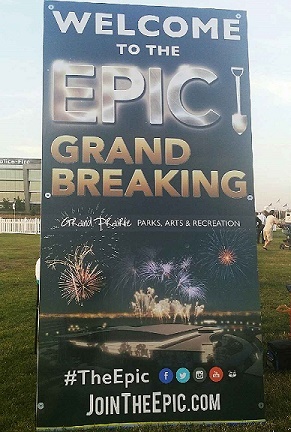 The Epic will be located in West Central Park west of State Highway 161. According to https://jointheepic.com/faq The Epic is expected to be completed by May of 2017. Halloween Recipes For The Entire Family and Goblins too! Day Trippin’ with Chet Garner, “The Day Tripper”! The Dallas Entertainment Journal is seeking interns. Email your resume to info@dallasentertainmentjournal for your chance to intern with the best new Entertainment Site in Dallas. Summer Internships begin June 2nd.